Having kids has made me hyper-aware of many things. One of them is the extreme difficulty in finding books that extol kindness as a virtue. Oh, there are oodles of books that are all about “being kind”, but by and large, the vast majority of “books about kindness” tend to approach it from an extremely materialistic point of view: be kind, and ye shall be rewarded [with material gifts, social status, social power etc.]. Rarely is it presented that one should be kind because it’s good thing to do. 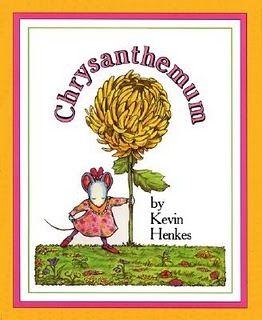 Kevin Henkes’ Chrysanthemum is fascinating in how, in a compact and extremely fun and engaging story, it does precisely this. The story of the titular young mouse - who loves her name until she starts school and immediately finds it (and her) the target of a great deal of malicious bullying - moves along at a clip pace. The prose flows rhythmically and simply, and the page layout is catchy and colorful. And the story is brutal, honest, real, and powerful. We’re given four brief pages to get to know our happy mouse before she goes to school, but we get a clear sense of how happy she is - and how quickly the treatment she receives from her peers (and the non-interference of her teacher) tears that to shreds. That’s the brilliance of this book, from the standpoint of its’ central point: we see, in plain and brutal terms, just how devastating the unkindness of her peers and the indifference of her supposed mentors is on her, as well as one her parents. A case in point: the art in the book is good, and a huge amount of character information and narrative storytelling is conveyed through it. But look in particular at the pictures of dinner, before-and-after when Chrysanthemum comes home. Her parents’ support is, in part, bluster as they scramble to try to figure out what to do to help their child. We also see that the primary bullies are the ones that receive the rewards usually promised for “kindness”: they have a social circle and are never shown alone. They appear in very similar costumes whereas Chrysanthemum dresses in ever more “safe” clothing as the days wear on. When someone finally does intervene, the bullies never truly get their comeuppance - that’s not what this book is about - but Chrysanthemum gets what she so desperately needs: some measure of affirmation of her own self-worth. And we get to see what an amazing thing that is.